To me, creativity and motivation go hand in hand. 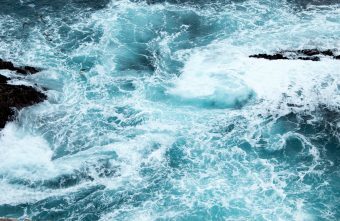 They come in waves, and when you finally grasp onto it, if you don’t keep nurturing that sucker it can slip back away. On the same spectrum, if you put all your time and energy into it then you can face burn out and lose your desire. 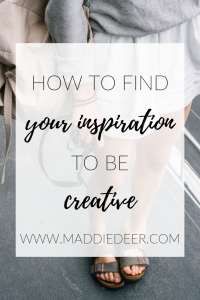 Sometimes, you need to know how to find your inspiration to be creative. Does this sound counterproductive? If you’re not on any timeline of sorts, this may be the first step for you. If you’ve put all your energy into your project and have lost your desire, sometimes all it takes is a break. Step back, work on something else, and let time do all the work. 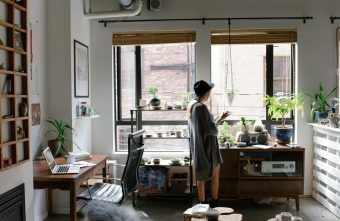 You may find that your desire returns faster than expected when you’re not putting so much pressure on yourself to create or finish a project. I love scrolling through Pinterest. It’s almost like a virtual inspiration or vision board. If you find that your inspiration has been lacking, physically creating a vision board may help. Print and cut out the things that inspire, motivate and encourage you. Put them on a corkboard or canvas, somewhere that you will see it every day. Don’t hide your inspiration away, put it on display to get those creative juices flowing! Nature is great! There have been studies upon studies that show all of the less obvious benefits of being outside. Some of these benefits being reduced risk of depression and increased creativity! Help your mental fatigue by taking time away from your devices and relaxing among the calming sounds and warm sunshine. Take a walk, weekend camping trip, anything that gets your outside- active or not. I’m not sure if a mindmap is a well-known thing, but basically, it is putting your thoughts onto paper in a visual way. You have a central concept and then you put your ‘key themes’ or big ideas branching off from this main idea. You can put even more related ideas or thoughts off of your key themes. I know some people use this as a study tactic, but I’ve never found it to be of much use in school. However, I find it to be a ton of use when I’m brainstorming creative ideas and putting together an execution plan. Surrounding yourself with other creatives can help with your inspiration and motivation to create. You can create with them or talk about your own projects. It pushes you to be your best and getting social with your work can be really fun! I find that when I have more inspiration and ideas to create, it’s typically when I’m daydreaming more often. 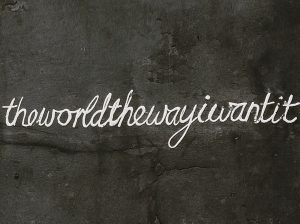 Let your mind wander and see where it leads you. It can lead to new ideas and inspiration. If you’re feeling stuck maybe you’re just overthinking or stressing yourself out! If you feel like you don’t have time to ‘daydream’ then try doing it as you lay down to go to sleep. You’re more relaxed and it’s easier to let your mind wander. Perfection can be a huge limiting factor. Pressuring yourself to create something perfect to the point where you’re unable to create anything at all (when you want or need to) can be difficult to overcome. Perfect is such a subjective perspective. Think about the ‘why‘ to what you’re creating. Is it self-expression? To help others? Create something meaningful? Nothing is completely perfect in the eyes of everyone. Perfectionism is great in the fact that it drives you to be better. But when you have fear rooted in your work because you don’t think it’s good enough, you’re holding yourself back. Push something out there that you’re proud of, regardless of if you view it as perfect. Don’t let perfectionism destroy your creativity and don’t place the value of your work on how perfect it is. Remember your way, how it makes you feel, and not what others will think of it! Along the same lines as perfectionism, don’t compare your work to the work of others. Creating something can’t be compared. Everyone interprets a project differently and has life experience that cannot compare with others. Comparing yourself to others can kill your own creativity. If you don’t want to put your work out into the world because you think it’s been done before or someone else has or could have done it better, you’re missing out! You have not created something and put it in the world. Someone could have resonated with your work in a way they have not with others. Getting trapped in a comparison spiral can lead to unfulfilling work. It can make you feel like what you’re putting out isn’t worthy or important when in reality it’s all self-limiting and self-inflicting beliefs. Your work is worthy and you can create if you want to, regardless as to if you think someone else is doing the same as you or could be doing it better. If you have a passion, for example, for watercolor but are feeling like you’re in a slump then picking up another outlet can help. This new outlet can allow you to express your creativity or inspire your photography (in this scenario). It gets your creativity flowing, sparking new ideas and getting you in your creative rhythm. How do you want your work to impact yourself, others, and the world? What makes you happy to create? What do you find limiting yourself? Time, stress, etc. What has inspired you to create in the past? What is distracting you right now? Find your distractions and tie the loose ends. Find your inspiration and give yourself what you need. Soon you’ll start creating just like you had. 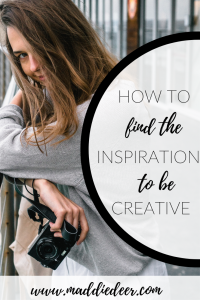 Do you have another fool-proof way on how to find your inspiration to be creative? I’d love to hear, so be sure to share in the comments below! If you enjoyed this post, feel free to share with your friends or pin one of the images below! Did you know I have a newsletter? 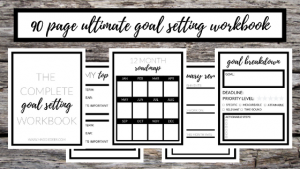 Sign up below and get my Goal Setting Workbook sent right to your email! Perfect! You've been added to my email list. Hang tight for my first ever newsletter that is coming soon! Yes! Pinterest is my favorite. Thanks for reading, Chloe! For me, taking a break is the best way for me to get my inspiration back. 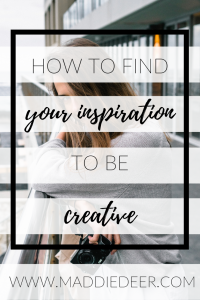 This is a great post for people who struggle with creativity & great ideas for those who already creative 💕 I enjoyed reading this !! Thanks for sharing! Lately, it’s been hard to not compare myself to others, and I know it’s something I should really avoid doing. It gets so easy with social media though! Yes! Love these tips and I’ll be sure to try them some time! It makes a real difference to change things up. Brian Eno had the right idea about this. His Oblique Strategies are a great tool. It’s amazing how much taking a break can actually help with creativity. Sometimes I think that helps me most. Totally agree! Thanks for reading, Jennifer! Yes to all of these!! I love mind maps, drawing things out. It really helps me to just put pen to paper and sometimes take a break. Really enjoyed this post! I am a daydream, wip writer who is always looking for ways to put down my creativity on paper. I will definitely try these ideas, I always have an issue putting it down on paper, then when I do I get into my head and find everything at fault which is why it takes so long for me to post on my own blog. Thank you! This is awesome! 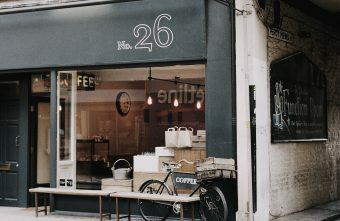 I actually did a post on how to be more creative too, so I really enjoyed seeing your take on this. All really great points! ooh, mind mapping sounds fun! I’ll have to try that with some writing projects I’m working on and see what pops out. Thanks for the ideas! These are great tips. Being creative is such an important part of our home…I love encouraging it. Great tips! I especially like the reminder about not comparing myself to others. Spot on, especially in the blogging world. I have to remind myself every once in awhile of this! Thanks for the read, Lisa! I love this! When I am stuck creatively taking a walk outside is the best way for me to get unstuck. Sounds like a great way to clear your head! Thanks for the read, Leigh! This is such a great post. I work as a graphic designer so I have to be creative everyday and come up with innovative, dazzling work while still trying to solve problems. I also want to learn more advanced skills like UX design but I just don’t have time between work, married life, blogging, working out, etc. but what helps a lot is surrounding myself with creatives. I joined a design group in my area and meeting a lot new people! I love this! I have issues pushing past perfection but I’ve been challenging this lately in different ways. The vision board is something I have never actually thought would benefit me in breaking through the creative barrier, but I will certainly consider it. I need to give myself time to be creative. That is my struggle. Plus I do compare myself to others way too often. I hope you can get some creativity back! I so needed this this week! Great suggestions, I cant wait to try the mindmap! I love mind-mapping, I hope you find it useful! This post was literally speaking to me! I feel like I’m constantly working on my creative side and trying to stay consistent, but I totally struggle. I think surrounding myself with more creatives and pushing past perfect will help me a ton. I love to daydream and spend time outside, especially this time of year. 🙂 Pinning this! This is a great list. I typically go outside or give it a break. Thanks for the read, Tayler! 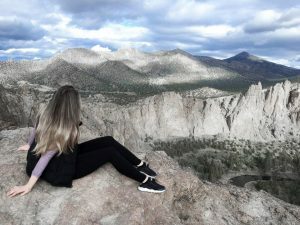 Vegan foodie, daydreamer, and adventure-seeker. 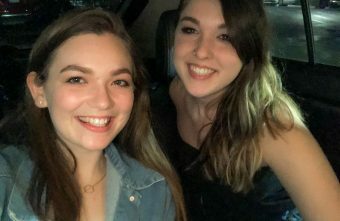 Can be found frequently buying plane tickets, driving to Portland just for food and drinking absurd amounts of coffee at all hours of the day.